Learn how to leverage user affinity data to make more effective personalized recommendations at scale. Effectively recommending content and products has become an essential requirement to increase conversions, and revenues at scale. Online recommendations are the product of complex algorithmic decisions, which mine users’ interactions and present opportunities for increased engagement in real time. There are a variety of factors to consider when choosing the right recommendation strategy, primarily the end goals users are looking to achieve. Certain approaches are constructed with a heavy emphasis on product and provide recommendations based on generic rankings (e.g. most popular products, trending articles) or specific page contexts (e.g. articles most similar to currently displayed content, products most frequently bought with currently displayed product). Others, however, utilize the true power of personalization and hone in on individual user preferences and affinities to make recommendations. For organizations with lengthy product catalogs or content indexes, affinity-based recommendation has proven to be a powerful method of making compelling recommendations when and to whom they matter most. Pinpointing user affinities begins with a qualitative and quantitative analysis of on-site behavior. A user’s interactions with content or product items—such as viewing or rating a certain product, adding a product to cart, searching for a specific brand or commenting on an article—provides important signals about their personal interests, preferences, and intent. As users interact with product or content items within a site, they simultaneously become exposed to a wide range of attributes that characterize those items: in eCommerce, these attributes can be a product’s brand, color, style, price-range and more; for publishers, these can be an article type (written or video), category, keywords etc. 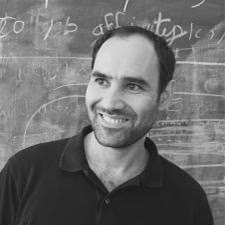 Combining data about user interactions with the attributes that characterize items, yields valuable insights into understanding user preferences on an individual level. This fusion of interactions and attributes lays at the heart of affinity-based recommendations , and can be leveraged through the use of multi-dimensional affinity profiles. The behavioral data organizations gather can be used to build rich, multi-dimensional affinity profiles for each and every user. Affinity profiles feature a weighted score, calculated and assigned by measuring the correlation between user interactions and the product or content attributes the user has interacted with most meaningfully. To illustrate, Jane’s affinity profile in the image informs us of her most preferred product categories and colors within an eCommerce site—with “red” being her most preferred color attribute value and “women” being her most preferred category attribute value. Ranking all the attribute values Jane has interacted with according to a hierarchy of her most meaningful interactions (viewed, added to cart, and purchased) narrows down Jane’s purchase intent and reveals which product attributes she has the greatest affinity towards. 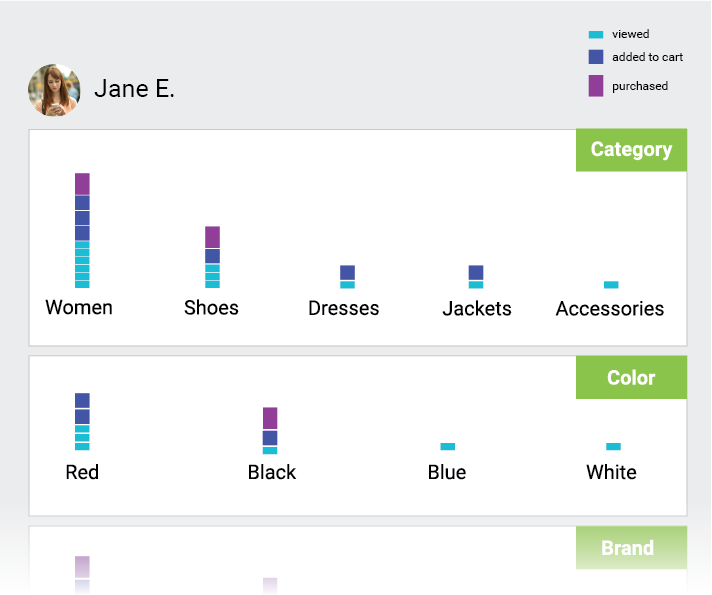 With this affinity data in hand, the site can recommend products that Jane will be most likely to engage with. Affinity profiles are hardwired to make the most effective recommendations even as user preferences change over time. User preferences are subject to and influenced by a variety of external factors, such as outdated trends, content staleness, and technology obsoleteness. To effectively capture changes in user preferences, affinity profiles are refined with every additional pageview, action, and event in real time, favoring recent interactions over older ones. Taking the recency of each interaction into account helps derive the user’s intent and allows organizations to consistently make highly effective and relevant recommendations. Affinity profiles are hardwired to make the most effective recommendations even as user preferences change over time. Affinity-based recommendation is one of the most important and efficient ways of untangling and leveraging the complex web of data surrounding user preferences. Aggregating user data through the use of affinity profiles yields valuable insights into understanding user preferences on an individual level, and allows organizations to tailor compelling product and content recommendations for maximized engagement opportunities.